This article is about the new Alitalias – CAI and SAI. For the old Alitalia, see Alitalia-Linee Aeree Italiane. Not to be confused with Aeritalia. Alitalia – Società Aerea Italiana (Alitalia – Italian Air Company), operating as Alitalia (Italian: [aliˈtaːlja]), is the flag carrier of Italy. The company has its head office in Fiumicino, Rome, Italy. Its main hub is Leonardo da Vinci-Fiumicino Airport, Rome, and a secondary is Linate Airport, Milan. Other focus airports are Catania-Fontanarossa Airport, Milan-Malpensa Airport, Palermo Airport and Naples Airport. In 2018, it was the twelfth-largest airline in Europe. The name "Alitalia" is an Italian portmanteau of the words ali (wings), and Italia (Italy). In 2008, a group of investors formed the "Compagnia Aerea Italiana" (CAI) consortium to buy the bankrupt Alitalia – Linee Aeree Italiane ("old" Alitalia) and to merge these with Air One, another bankrupt Italian carrier. On 30 October 2008, CAI offered €1 billion to acquire parts of the bankrupt airline, amidst pilots' and flight crew members' opposition to labour agreements. On 19 November 2008, CAI's offer was accepted by the bankruptcy administrator of Alitalia with the permission of the Italian government, at the time the majority shareholder of the bankrupt airline. Alitalia's profitable assets were transferred to CAI on 12 December 2008 after CAI paid € 1.05 billion, consisting of €427 million in cash and the assumption of responsibility for €625 million in Alitalia debt. A USA diplomatic cable disclosed in 2011 summarised the operation as follows: "Under the guise of a rather quaint (and distinctly un-EU) desire to maintain the Italian-ness of the company, a group of wealthy Berlusconi cronies was enticed into taking over the healthy portions of Alitalia, leaving its debts to the Italian taxpayers. The rules of bankruptcy were changed in the middle of the game to meet the government's needs. Berlusconi pulled this one off, but his involvement probably cost the Italian taxpayers a lot of money." On 13 January 2009, the "new" Alitalia launched operations. The owners of Compagnia Aerea Italiana sold 25% of the company's shares to Air France-KLM for €322 million. Air France-KLM also obtained an option, subject to certain conditions, to purchase additional shares after 2013. The "new" Alitalia has not claimed the old Alitalia's history as its own, as can be seen in official documents regarding the new "Alitalia Group". Instead, they stressed that they were a totally different company: they chose not to recognize benefits such as discounted tickets to former Alitalia-LAI workers and refused to honour passengers' claims against the old Alitalia. The new Alitalia does not own many of its operating airplanes. (Alitalia-LAI had owned all of its airplanes.) Almost every plane that CAI had acquired from the old Alitalia was sold or decommissioned. Alitalia-CAI airplanes are leased mostly from Aircraft Purchase Fleet (it), an Irish company owned by Carlo Toto, the former owner of the bankrupt Air One, which was merged in 2008 into Alitalia-CAI when the new company was founded. In January 2010, Alitalia celebrated its first anniversary since the relaunch. It carried 22 million passengers in its first year of operations. In 2011, 25 million passengers were carried. On 1 February 2010, it was announced that Alitalia crew would go on a four-hour strike over wages. This was the first strike action for Alitalia since the relaunch. On 11 February 2010, Alitalia announced that, starting from March 2010, it would use Air One as a low-fare airline ("Smart Carrier"), with operations based at Milan Malpensa Airport, focused on short-haul leisure routes. It was predicted that the subsidiary would handle 2.4 million passengers by 2012. In 2011, 1.4 million passengers were carried by the subsidiary. Although operations were initially to be concentrated at Milan Malpensa, Air One later operated from Milan-Malpensa, Venice-Marco Polo, Pisa and Catania as of January 2013. On 12 February 2011, information was released about a possible merger between Alitalia and Meridiana Fly, another Italian carrier. The merger did not occur. On 23 February 2011, Alitalia and ENAC announced the introduction of a safety card written in braille and characters in 3-D relief, which is the first of its kind. On 25 January 2012, Alitalia signed memoranda of understanding with two other Italian airlines, Blue Panorama and Wind Jet, and said to have started processes "aimed at achieving integration" with them. By the end of July 2012, the Italian antitrust authority allowed Alitalia to acquire Wind Jet, but in return Alitalia would have to cede slots on domestic routes. Faced with this, Alitalia cancelled the plans a few days later in August 2012. 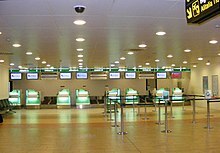 On 3 May 2013, in a sting codenamed "Operation Clean Holds", police made 49 arrests at Rome's Fiumicino airport, with another 37 in Italian airports including Bari, Bologna, Milan Linate, Naples, Palermo and Verona. All were Alitalia employees caught on camera and most were charged with aggravated theft and damage. In late 2013, facing bankruptcy, the loss of a major fuel supplier, and a possible grounding by Italy's civil aviation authority, the airline announced a €500 million rescue package which included a €75 million investment by the Italian state-owned postal operator. In June 2014, the Abu Dhabi-based UAE national airline Etihad Airways announced it was taking a 49% stake in Alitalia. On 30 September 2014, Alitalia's budget subsidiary Air One ceased flight operations. On 1 January 2015, Alitalia-CAI formally passed its operations to Alitalia-SAI, a new entity owned 49% by Abu Dhabi-based Etihad Airways and 51% owned by the former Italian stakeholders of Alitalia-CAI. In May 2015, Alitalia announced it would terminate its partnership with Air France-KLM in 2017, stating that there were no longer enough advantages from the joint venture to keep it up. In February 2016, Alitalia announced that in late March 2016 it would cancel most of its routes from Pisa, including Moscow, Prague, Berlin, Catania and Tirana. Alitalia decided to continue flying to Olbia and Rome. On 25 April 2017, after Alitalia employees rejected job-cuts proposal aimed at reducing costs, the airline announced that it will start going through a bankruptcy process, beginning with the appointment of an administrator. The Italian government permitted Alitalia to file for bankruptcy on 2 May 2017. On 17 May 2017, after the government had ruled out nationalizing the airline, it was officially put up for sale to be auctioned off. In June, EasyJet expressed interest in purchasing the airline.Ryanair also expressed interest but dropped its bid after the chaos caused by Ryanair's flight cancellations. In 2018, Delta Air Lines, EasyJet and Italian railway company Ferrovie dello Stato Italiane lodged formal expressions of interest to acquire Alitalia; talks between the parties were opened in February 2019. In March 2019, EasyJet announced that it had withdrawn from the discussions. After the official visit of Chinese President Xi Jinping to Rome, China Eastern Airlines expressed interest in Alitalia's rescue plan and could spend up to €100 million in exchange for a 10% stake. Alitalia's head office is located in Building Alfa at Via Alberto Nassetti in Fiumicino, Province of Rome. The corporate headquarters was designed by AMDL, a Milan-based architecture firm. The head office was previously in a building at Piazza Almerico da Schio, also in Fiumicino. The CEO of the airline from March 2016 to April 2017 was Cramer Ball, Chairman was Luca Cordero di Montezemolo, the vice chairman was James Hogan, ex president and CEO of Etihad Airways. "The pleasure of flying Made in Italy"
As of 29 July 2009, Alitalia is the first airline for domestic flights in Italy and, as of 4 October 2010, Alitalia is in second place for international flights to/from Italy. Alitalia was nominated as Europe's most punctual airline in 2010, and as one of the world's five most punctual airlines in 2011. As of 28 October 2010, Alitalia has 53% of the market share on domestic routes (based on seat capacity). Alitalia in 2017 has been the third most punctual Mainline (aeronautics) airline in Europe after airBaltic and Aer Lingus registering an overall 82.4% on-time performance record. Alitalia's shareholders have been CAI (Compagnia Aerea Italiana) 100%. CAI – Compagnia Aerea Italiana (Italian Air Partnership) is an Italian airline holding company whose main shareholders were: Intesa Sanpaolo (20.59%), Poste Italiane (19.48%) and UniCredit (12.99%). Alitalia serves 97 destinations (as of April 2016). Alitalia's hub is at Rome's Leonardo da Vinci–Fiumicino Airport. Four other Italian airports are focus cities. Alitalia has been in the SkyTeam alliance since 2009; Alitalia-LAI originally joined in 2001. Alitalia has since arranged code-share agreements with SkyTeam members, allowing passengers to fly to numerous destinations (with some or all segments operated by airlines other than Alitalia) using a single Alitalia ticket. In July 2010, Alitalia also joined Air France, KLM and Delta's transatlantic Joint Venture, meaning that the profits from flights across the Atlantic are shared between the four airlines. Between 2009 and 2011, Alitalia renewed its fleet with 34 new aircraft, while 26 older planes were retired. The renewal process ended in early 2013. These new planes are not owned by Alitalia itself, but are leased mostly from Aircraft Purchase Fleet, an Irish leasing company created by former Air One owner Carlo Toto primarily to purchase the new Alitalia fleet. Following the Air One merger, the entire fleet that was not already leased from other lessors, plus the former Air One fleet that was owned by Air One outright, came under the ownership of APF, a subsidiary of Toto's Italian conglomerate Toto Holding. The entire fleet, except the two new A330s, is now on the Irish registry instead of the Italian registry. With the new strategic plan focused on long haul, in January 2015 it was announced that seven wide-bodies would join the fleet beginning in May 2015 with an A330-200 in a new livery. Alitalia during the 1960s started leading European airlines into the Jet Age and it became the first airline in Europe to adopt an all jet aircraft fleet in 1969. The Boeing 767-300ER was introduced to the Alitalia-Linee Aeree Italiane fleet in 1994, and retired after 17 years of service in 2012. The last 767 flight was AZ845 from Accra via Lagos to Rome on 25 October 2012. The McDonnell Douglas MD-82 was introduced to the Alitalia-Linee Aeree Italiane fleet in 1983, and then retired in 2012 after 29 years of service. The last flight with this aircraft type operated on 27 October 2012 using the plane with registration I-DATI on flight AZ1740 (Catania-Milan-Linate). The same aircraft on 17 December 2012 operated a memorial flight from Rome-Fiumicino Airport to Trieste Airport with journalists and ex-Alitalia's CEO Andrea Ragnetti on board. During landing, I-DATI was supported by Frecce Tricolori; they did a show for the occasion. In mid-2009, a Boeing 767-300ER (EI-DBP) was painted in the SkyTeam livery. On 19 July 2010, an Airbus A320-200 (EI-DSA), which had previously been in the Air One livery, was painted in a special "Alitalia.com" livery. This plane is now wearing Alitalia-SAI livery. In March 2012, an Embraer E-190-100LR (EI-RND) was delivered in the SkyTeam livery. In March 2012, a Boeing 777-200ER (EI-DDH) was painted in the SkyTeam livery. In April 2012, an Airbus A321-100 (EI-IXI) was painted in the historic livery of Freccia Alata-Linee Aeree Italiane, Alitalia's predecessor. This plane is now stored. In November 2013, an Airbus A330-200 (EI-DIR), which had previously been in the Air One livery, was painted in the SkyTeam livery. In March 2014 an Airbus A330-200 (EI-EJG) and an Airbus A320-200 (EI-DSM) were painted in a special livery dedicated to Calabria. EI-EJG is now wearing Alitalia-SAI livery and EI-DSM is sold to Congo Airways. In April 2014 an Airbus A319-100 (EI-IMI) was painted in a special livery dedicated to Friuli-Venezia Giulia. From August 2015 this plane is wearing Alitalia-SAI livery. In October 2014 an Airbus A330-200 (EI-EJM) was painted in a special livery, in cooperation with its partner Etihad Airways, dedicated to Expo 2015. This plane is now wearing Alitalia-SAI livery. Alitalia has four classes of service: Economy, Premium Economy, Business Class Medium Haul and Magnifica. The airline's frequent-flyer program is named "MilleMiglia" (thousand miles), and is part of the SkyTeam alliance program, allowing passengers to collect miles and redeem them with free tickets across the whole alliance. It also grants access to Alitalia's Privilege clubs, Ulisse, Freccia Alata, and Freccia Alata Plus, depending on the number of miles collected in a year, with various advantages depending on the club. These clubs give access to SkyTeam Elite (Ulisse) and SkyTeam Elite+ (Freccia Alata, Freccia Alata plus). As of 3 February 2015 Etihad Airways has acquired a 75 per cent stake in Alitalia Loyalty S.p.A, the owner and operator of MilleMiglia, Alitalia’s frequent flyer program, with Alitalia retaining the remaining 25 per cent stake. Alitalia Loyalty is now part of Global Loyalty Company (GLC), a loyalty and lifestyle company that allows Etihad Airways and its partners to target the global loyalty market more effectively, whilst driving technology and back office synergies. GLC also consists of Etihad Airways’ Etihad Guest, airberlin’s topbonus and Jet Airways’ JetPrivilege programs. Together, Etihad Guest, topbonus, JetPrivilege and MilleMiglia have a combined total of 14 million members worldwide. On 24 April 2011, an attempt was made to hijack Alitalia Flight 329, en route from Charles de Gaulle Airport, Paris, France to Fiumicino Airport, Rome and divert it to Tripoli International Airport, Libya. The hijacker, reported to be an advisor to the Kazakhstan delegation to UNESCO, was subdued by cabin crew and other passengers. He was arrested and taken into custody after the aircraft made a safe landing at Rome. On 29 September 2013 at 20:10, an Alitalia Airbus A320 flying from Madrid–Barajas Airport to Leonardo da Vinci–Fiumicino Airport failed to lower the landing gear during a storm on landing and the aircraft toppled, skidded off the runway and crashed. 10 passengers suffered minor injuries and all 151 passengers and crew were evacuated and taken to the hospital. ^ Today's Alitalia – Compagnia Aerea Italiana (CAI) is distinct from Alitalia – Linee Aeree Italiane (LAI), which was founded in 1946. In 2009, CAI acquired the callsign, branding rights, and other assets that once belonged to LAI. ^ "Modello di Organizzazione, Gestione e Controllo ex D.LGS 231/01" (PDF). Alitalia - Compagnia Aerea Italiana S.p.A. p. 21. Archived from the original (PDF) on 7 January 2015. ^ a b "Etihad Airways acquires majority stake in Alitalia's MilleMiglia frequent flyer program" (PDF) (Press release). Alitalia. 3 February 2015. Retrieved 24 December 2016. ^ a b c "Network". Alitalia. Archived from the original on 22 April 2016. Retrieved 24 December 2016. ^ "Relazione ai sensi dell'articolo 1, comma 1-bis del decreto legge 27 aprile 2018, n. 38, convertito con modificazioni in legge 21 giugno 2018, n. 77" (PDF). Amministrazionestraordinariaalitiasai.com. Retrieved 27 February 2019. ^ Hofmann, Kurt (5 April 2017). "24-hour strike forces Alitalia to cancel 394 flights". Air Transport World. Archived from the original on 6 April 2017. ^ a b "Contacts". Alitalia Corporate. Retrieved 24 December 2016. Headquarter Via Alberto Nassetti SNC 00054 Fiumicino. ^ "Alitalia to enter bankruptcy proceedings - BBC News". BBC.com. 2 May 2017. Retrieved 2 May 2017. ^ a b GOVERNO: FALLIMENTO DI ALITALIA! SALVATI DALLA BANCAROTTA SOLO AIR ONE E MALPENSA (Pirozzi e Biasco). | IlpuntoDue "La Nuova Compagnia, servirà a salvare la Air One di Toto, che accumula passivi ogni giorno, insieme al salvataggio dell’aeroporto di Malpensa, che correva il rischio di perdere 62 attracchi al giorno e il declassamento ad aeroporto di secondo livello." translated: "The New Company (Alitalia-CAI) will save Toto's Air One, which has its debts increased every day, together with Malpensa Airport, which could have lost 62 slots per day and it could have been declassed to second-level airport." ^ Deepa Babington (19 November 2008). "Italy agrees sale of Alitalia to CAI consortium". Reuters.com. Retrieved 29 January 2012. ^ "Alitalia, Fantozzi accetta l'offerta di Cai: 1.052 milioni" (in Italian). SKY TG 24. 21 November 2008. ^ "Boykott CAI (Alitalia+AirOne)". Gurgle Italy. Retrieved 7 October 2012. ^ "Alitalia, vola italiano ma a quale prezzo." (Archive, shows an Italian translation of a 3 October 2008 cable from the USA Embassy Rome, see in the original English, Archive) La Repubblica. ^ Dinmore, Guy; Done, Kevin; Boland, Vincent (12 January 2009). "Air France-KLM buys 25% of Alitalia". Financial Times. Retrieved 24 December 2016. ^ Elliott, Christopher (5 November 2010). "Three years later, Alitalia still owes me $528 for my lost baggage and ruined Italian vacation". Consumer Travel. Archived from the original on 7 November 2010. Retrieved 24 December 2016. ^ a b "About us". APFL. Archived from the original on 19 November 2010. Retrieved 24 December 2016. ^ "Alitalia: Colaninno, 22 MLN Passeggeri Nel 2009. E Quest'Anno di Piu' (abnm)". Informazione.it. 15 January 2010. Retrieved 7 October 2012. ^ a b c d e Alitalia (24 February 2012). "Alitalia's Board Of Directors Approves The Group Financial Statement For 2011" (Press release). Retrieved 24 December 2016. ^ Segreti, Giulia; Dinmore, Guy (1 February 2010). "Alitalia faces first strike action since emerging from bankruptcy". Financial Times. Retrieved 7 October 2012. ^ "Alitalia: 3 milioni di pax a Malpensa con Air One" (in Italian). TTG Italia. 21 September 2012. Retrieved 7 October 2012. ^ Remondini, Chiara (12 February 2011). "Alitalia, Meridiana Fly Are in Merger Talks, Messaggero Reports". Bloomberg. Retrieved 7 October 2012. ^ "ENAC and Alitalia present the safety card written in Braille and characters in 3-D relief introduced on scheduled flights for the first time in the world" (Press release). Alitalia. 23 February 2011. Retrieved 24 December 2016. ^ "Alitalia plans merger with Blue Panorama and Wind Jet". Flightglobal. 25 January 2012. Retrieved 7 October 2012. ^ "volaspheric: Alitalia has cancelled Wind Jet acquisition". Volaspheric.blogspot.de. 2 August 2012. Retrieved 7 October 2012. ^ Laura Smith-Spark (4 May 2013). "Italian police arrest dozens over Alitalia baggage theft". Cnn.com. ^ "Alitalia Secures €500 million in New Funding, Avoids Bankruptcy". Frequent Business Traveler. 12 October 2013. Retrieved 12 October 2013. ^ a b ""È arrivato il sì di Etihad", sempre più vicino l'accordo con Alitalia". Corriere della Sera. 1 August 2014. Retrieved 24 December 2016. ^ "The New Alitalia Takes Off" (Press release). Alitalia Corporate. 1 January 2015. Retrieved 24 December 2016. ^ Frommberg, Laura (19 May 2015). "Alitalia trennt sich von Air France KLM — Scheidung auf Italienisch". Aerotelegraph.com (in German). Retrieved 24 December 2016. ^ "Alitalia lascia l'aeroporto di Pisa: rotte sostituite da altre compagnie". R.it Firenze (in Italian). 3 March 2016. Retrieved 24 December 2016. ^ "Alitalia to Start Bankruptcy Process as Workers Spurn Bailout". Bloomberg.com. 2017-04-24. Retrieved 2017-04-27. ^ "Alitalia to Start Bankruptcy Process as Workers Spurn Bailout". Bloomberg. Retrieved 2017-05-22. ^ "Italy kicks off Alitalia sale process". Reuters.com. 2017-05-17. Retrieved 2017-05-18. ^ "EasyJet confirms interest in Alitalia". atwonline.com. Retrieved 2017-06-19. ^ "Ryanair drops its bid to buy ailing Alitalia". Thelocal.it. 27 September 2017. ^ "FS launches bid to acquire Alitalia". International Railway Journal. 2 November 2018. ^ Clark, Oliver (13 February 2019). "State rail operator to open Alitalia talks with EasyJet and Delta". Flight Global. ^ Clark, Oliver (18 March 2019). "EasyJet pulls out of Alitalia privatisation process". Flightglobal.com. ^ "China Eastern Interested In Buying Alitalia". 0 Simple Flying. 30 March 2019. ^ "Alitalia Headquarters" (Archive). AMDL. Retrieved on 31 August 2015. ^ "Cramer Ball". Alitalia Corporate. Retrieved 24 December 2016. ^ "Corporate Bodies". Alitalia Corporate. Retrieved 24 December 2016. ^ EDI. "Alitalia, Vola con te". Retrieved 24 December 2016. ^ "Alitalia flights and customer reviews". Europelowcost. Retrieved 7 October 2012. ^ Alitalia. 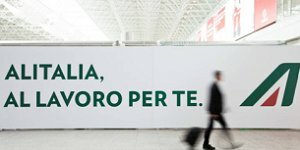 Alitalia, al lovoro per te. Archived from the original on 2 January 2010. Retrieved 24 December 2016. ^ Varisco, Giorgio (3 June 2012). Airbus A320-214 Alitalia ("Muoviamo chi muove l'Italia" livery) - Milano Linate. flickr. Retrieved 24 December 2016. ^ Alitalia (4 December 2013). Alitalia Scegli come volare. YouTube (in Italian). Retrieved 24 December 2016. ^ "Alitalia (Home)". Alitalia. Archived from the original on 1 October 2012. Retrieved 24 December 2016. ^ "'Alitalians do it better' new motto. Etihad CEO presents slogan for Alitalia staff to wear" (in Italian). ansa.it. 12 September 2014. ^ "Alitalia Board of Directors analyses the economic trend of the first six months. Positive results considering the critical international scenario" (PDF) (Press release). Alitalia. 29 July 2009. Retrieved 24 December 2016. ^ "Alitalia's Board of directors discussed on the management trend in 1Q10". Avionews. World Aeronautical Press Agency. 13 May 2010. Retrieved 24 December 2016. ^ "Alitalia: financial statements for the first half of 2010". Avionews. World Aeronautical Press Agency. 2 August 2010. Retrieved 24 December 2016. ^ a b "Alitalia: Andamento Gestionale 2010" (in Italian). AgenParl. 28 October 2010. Archived from the original on 22 July 2011. Retrieved 24 December 2016. ^ "Il Consiglio di Amministrazione di Alitalia approva il progetto di bilancio 2010. Crescono passeggeri e ricavi. Risultato operativo a – 107 ml. € ( +167 ml. € Vs. 2009). Superato l'obiettivo di dimezzamento delle perdite operative" (PDF) (Press release) (in Italian). Alitalia. 25 February 2011. Archived from the original (PDF) on 4 October 2011. Retrieved 24 December 2016. ^ "Alitalia perde 89 milioni ricavi in crescita "in linea con obiettivi"" (in Italian). Repubblica.it. 10 May 2011. Retrieved 24 December 2016. ^ "Nel terzo trimestre ricavi in crescita del 12%, risultato netto positivo per 69 ml. € e risultato operativo positivo per 90 ml. €. nei primi 9 mesi dell'anno risultato operativo positivo per 21 ml. €" (Press release) (in Italian). Alitalia. 26 October 2011. Retrieved 24 December 2016. ^ "Alitalia,utile di 90 milioni nel terzo trimestre – ECONOMIA". Lettera43.it. Retrieved 7 October 2012. ^ 4-traders. "Alitalia – Compagnia Aerea Italiana S.p.A. : Midyear Report 2012. CEO Andrea Ragnetti SAYS: "The Worst is over, we are targeting a trend reversal in the second half of the year"". 4-traders.com. Retrieved 7 October 2012. ^ "Gruppo Alitalia: Risultati del terzo trimestre 2012" (Press release) (in Italian). Alitalia. 25 October 2012. Retrieved 24 December 2016. ^ "Alitalia's Board of Directors approves the group financial statement for 2012" (Press release). Alitalia. 25 February 2013. Retrieved 24 December 2016. ^ "Alitalia Group: 2013 first quarter operating results" (Press release). Alitalia. 27 May 2013. Retrieved 24 December 2016. ^ "Alitalia Group: Board of Directors" (Press release). Alitalia. 31 October 2013. Retrieved 24 December 2016. ^ "Alitalia results Q1 2014". ^ "Alitalia has over half of domestic market but Ryanair is twice as big on international routes; easyJet No. 1 at Milan Malpensa". anna.aero. Retrieved 7 October 2012. ^ "best on-time records 2017" (PDF). ^ "Shareholders". Alitalia Corporate. Retrieved 24 December 2016. ^ "Azionariato". Alitalia Corporate. Archived from the original on 23 October 2014. Retrieved 24 December 2016. ^ "Profile on Alitalia". CAPA. Centre for Aviation. Archived from the original on 2016-10-30. Retrieved 2016-10-30. ^ "Alitalia and Aerolineas Argentinas to Boost Commercial Agreement". Aviationtribune.com. 25 May 2017. ^ "ANA and Alitalia in commercial pact". Flightglobal.com. 27 March 2018. Retrieved 27 March 2018. ^ "Nuovo code share per Alitalia, accordo con Avianca Brasil" [New codeshare agreement for Alitalia with Avianca Brazil]. Ttgitalia.com (in Italian). 28 June 2018. Retrieved 28 June 2018. ^ Liu, Jim (23 November 2017). "Alitalia / Bulgaria Air expands codeshare partnership in W17". Routesonline.com. Retrieved 23 November 2017. ^ "Alitalia / Hainan Airlines launches codeshare service from Jan 2017". Routesonline. Retrieved 2017-05-22. ^ "Alitalia and Pegasus Airlines enter into a codeshare agreement". Corporate.alitalia.it. ^ "Alitalia and Royal Air Maroc enter into a codeshare agreement". Corporate.alitalia.it. ^ "Alitalia and Royal Jordanian enter into a codeshare agreement". Payloadasia.com. 2017-02-06. Retrieved 2017-05-22. ^ Ltd. 2019, UBM (UK). "Alitalia resumes Uzbekistan Airways codeshare service from June 2017". Routesonline. ^ Ball, Deborah; Michaels, Daniel (28 November 2001). "Struggling Alitalia Is Further Hit By Attacks, Economic Downturn". The Wall Street Journal. Retrieved 24 December 2016. ^ "Our members". Skyteam.com. Retrieved 7 October 2012. ^ "Alitalia joins transatlantic joint venture | Reuters". In.reuters.com. 5 July 2010. Retrieved 7 October 2012. ^ "Alitalia Fleet Details and History". Planespotters.net. ^ "Italy: Alitalia's rich heritage". ^ "EI-DBP". Airliners.net. 31 May 2009. Retrieved 22 January 2014. ^ Gianluca Mantellini (24 July 2010). "EI-DSA". Airliners.net. Retrieved 22 January 2014. ^ Mirko Krogmann (17 July 2013). "EI-RND". Airliners.net. Retrieved 22 January 2014. ^ Giorgio Parolini (27 December 2013). "EI-DDH". Airliners.net. Retrieved 22 January 2014. ^ "EI-IXI". Airliners.net. 25 September 2013. Retrieved 22 January 2014. ^ "Travel Classes". Alitalia. Archived from the original on 2016-03-26. Retrieved 24 December 2016. ^ "Business Class Long Haul". Alitalia. Retrieved 24 December 2016. ^ a b "Welcome on board the MilleMiglia program". Alitalia. Retrieved 30 January 2012. ^ Hradecky, Simon (24 April 2011). "Accident: Alitalia A321 enroute on Apr 24th 2011, attempted hijack". Aviation Herald. Retrieved 25 April 2011. ^ Accident description for EI-EIB at the Aviation Safety Network. Retrieved on 2016-12-24.